Idea Factory’s first localized release in the Monster Monpiece series, simply titled Monster Monpiece, has been under some scrutiny from its fans regarding the possible censorship and removal of cards from the game. Today, Idea Factory International’s CEO, Haru Akenaga, has published an open letter discussing his thoughts on bringing the Vita card game to an international audience. The gameplay, game system, and storyline are fully intact and Idea Factory International strives to localize and publish Idea Factory titles with the same content as their Japanese releases. 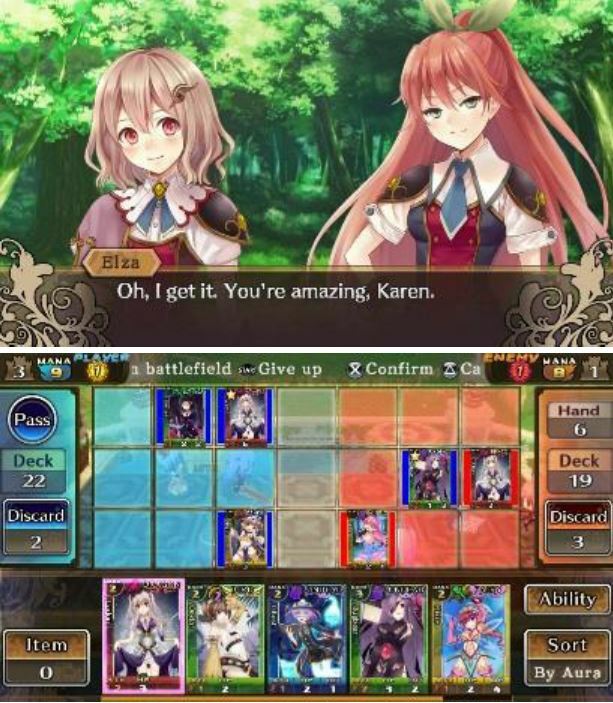 Here is the list of Monster Girls whose images have been limited to that of their level 1, 2, or 3 evolution form due to the strong sexual nature of the card images: Vampire, Kraken, Goblin, Cockatrice, Kobold, Skeleton, Titania, Bahamut, Fia, Brownie, Pegasus, Mandragora, Mau Sibau, Rafflesia, Death Scorpion, Phantom, and Tengu. Also published today was a letter from Akenaga-san discussing his thoughts on why the censorship was so important to getting Monster Monpiece published outside of Japan. Thank you to all our fans for your feedback and opinion, both pros and cons, regarding the censorship of Monster Monpiece. First of all, please allow me to clarify that Idea Factory International is fundamentally against censorship and we will never censor a title purely as a strategy to increase sales. It is our policy as well as our priority that our localizations stay true to the original creativity and vision of the developers in order to meet our fans’ expectations for theoriginal Japanese games. In the past years, Idea Factory has licensed out all of its titles to third party publishers for the western markets. The Monster Monpiece license was also offered to third party publishers but none were interested in acquiring the license. The main reasons cited were that the title was too “hard-core” and “niche”, making it extremely difficult to forecast enough sales to make this a profitable title for the western markets. In addition there was significant concern that some of the images of the Monster Girls would be inappropriate and unacceptable for release in these markets. Despite these concerns, because we received so many requests from our fans and because Idea Factory International was established in the US for the main purpose of nurturing the IF fan communities outside of Japan, we made the decision to do our best to bring Monster Monpiece to our fans in these markets. That being said, as a Company that would like to remain relevant and viable for the long term in these markets, we believed it was necessary to make some minimum modifications in order for the product to be suitable/acceptable for publishing, giving the title the best chance to get to market while still staying as true to the original game as possible. Please be assured that we did our utmost to make sure that the modifications/censoring we determined necessary for Monster Monpiece were at the absolute minimum. We have paid meticulous attention to which images to replace/modify so as not to affect the gameplay and game system itself. Idea Factory International intends to focus its ongoing licensing and publishing activities primarily on titles that will appeal to the most hard-core gamers within the JRPG niche of the North American and European game markets. As such, this first title, Monster Monpiece, is an important test case for us and the final results will weigh significantly towards our decisions regarding future titles for these markets. We decided to release Monster Monpiece in these markets because we wanted to make our fans happy. However, if those same fans find that the modifications we felt we had to make have made the localized version of the game completely unacceptable, perhaps it was not the right decision to try to localize and publish this title for these markets. Perhaps it would be in the best interest of both our fans and our Company to publish only those titles that will not require any censoring or modification. To conclude, I believe that with regard to Monster Monpiece we have made the best possible decision, taking into consideration both our customers’ satisfaction as well as our corporate ethical responsibilities to adhere to all local legal requirements. However, we welcome continued feedback from our fans both before and after the release of the game. We value everyone’s opinion and will take it all under consideration when planning for our future titles. Thank you again to all of Idea Factory’s fans for your ongoing enthusiasm and support.